Alessandro Volta is one of the most familiar names in the field of electrical engineering. But he is familiar, yet not famous. He is familiar in the sense that the unit of voltage, which is volt, is named after Alessandro Volta. Alessandro Volta contributed a lot in our field. He did so much to merit him the honor of having the unit of volt, named after him. His most famous contribution was the development of the so-called voltaic pile, a forerunner of the electric battery, which produced a steady stream of electricity. 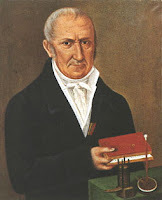 Alessandro Volta constructed a device for accumulating a large charge by a series of inductions and groundings. By further study of "animal electricity" of Galvani, he found that the current was generated from the contact of dissimilar metals, and that the frog leg was only acting as a detector. Using this principle, in 1800 he constructed the first battery to produce electricity. Volta's method of stacking round plates of copper and zinc separated by disks of cardboard moistened with salt solution was termed a Voltaic pile. By touching the copper and zinc disks together, Volta showed them to be oppositely charged. Volta was born in Como, Italy and educated in the public schools there. His full name is Alessandro Giuseppe Antonio Anastasio Volta. In 1774 he became professor of physics at the Royal School in Como, and in the following year he devised the electrophorus, an instrument that produced charges of static electricity. There are records of Napoleon giving him the title of Count in gratitude for his inventions that have revolutionized the world of today. Alessandro Volta is truly a pioneer of electrical science, one of the greatest minds and electrical engineer of all time. Alessandro Volta - Electrical Engineering Hero.